Summary: In this series about four girls from Rosewood, PA, you will learn the true meaning of friendship. In 7th grade Alison DiLaurentis ruled the school and her best friends were right by her side. One night Alison disappears and her friends can’t believe it. They all personally think it was their fault she died. Three years later, the case is still unsolved and things have quieted down about it. The four former best friends – Spencer, Aria, Emily and Hanna – have drifted apart but must now come back together when they receive mysterious notes signed “A” and Alison’s case is reopened with a shocking discovery. Who will like this book? This book is for readers who can handle mature themes. Also, if you like secret or sneaking around, you will like this book. If you like this, read this: The Gossip Girl series by Cecily von Ziegesar. The Private series by Kate Brian. The Privilege series by Kate Brian. Also, you might also like the TV show Pretty Little Liars shown on ABC Family, Tuesday at 8/7 c.
Summary:In the final volume of the trilogy, Meggie is determined to save her father. Having escaped from the evil clutches of the Adderhead, whom is now immortal, Mo is finding himself getting deeper and deeper into the role of the Bluejay. As he and the Black Prince continue to fight against the Adderhead’s reign of despair, more troubles are brewing within the Inkword. Mortorla is back and finds alliance in an old friend. Farid has yet to revive Dustfinger and is neglecting Meggie’s feelings. Fengolio has lost his ability to write, as Orpheus starts writing more devastating trails with Fengolio’s words. 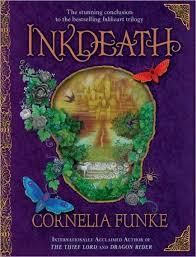 With everything falling apart in the Inkworld, Meggie’s desires to leave become more urgent…Too bad that it’s too late. Who will like this book? : If you liked the first two of the trilogy, you’re bound to like this one. If you haven’t, then the Inkworld trilogy is meant for dreamers, who see the impossible and make it real. There’s plenty of fantasy, a good love plot, and viciousness within the heroes and villains alike. If you like this, you should try: Ella Enchanted by Gail Levine, Goose Girlby Shannon Hale, anything by Dianna Wynne Jones, The Chronicles of Narnia by C.S. Lewis, Faerie Wars by Herbie Brennan, and Maximum Ride by James Patterson. Summary: This collection of four graphic novels (Gifted, Dangerous, Torn and Unstoppable) collects the outstanding story arc by Joss Whedon, who is most famous for creating the TV show Buffy the Vampire Slayer. The team, including Cyclops, Wolverine, Shadowcat, Beast, and Emma Frost, must stop Ord, an alien from the Breakworld, who has developed a ‘cure’ for the genetic mutation that gives the X-Men their powers. Why is Ord so determined to disable the mutants? Because it has been prophesied that a mutant will destroy his home planet. Sounds complicated? It’s not really. This is a great comic for beginners and lifelong X-fans. Over the span of four short books, Whedon and Cassaday spin a complete story you can dive right into, with plenty of twists and turns, as well as visits from other favorite Marvel characters. These books are a perfect companion to all those superhero movies you’ve been watching this summer. Who will like this book? : Fanboys…and girls. Whedon has quite a following from Buffy, Angel, and Firefly. If you like this, try this: Buffy the Vampire Slayer: Season Eight by Joss Whedon. Any of the Ultimate X-Men collections. Summary: Alex Morales lives in Manhattan with his parents and two sisters, the angelic Brianna and devilish Julie. His life is ordinary: He works hard in school and at his job at a pizza place. But everything changes in an instant when the unthinkable happens: An asteroid hits the moon, knocking it out of orbit. As a result, tidal waves erase entire coastlines, newly formed volcanos erupt, covering the sun and stars with a cloud of gray ash, and millions die. When Mami and Papi don’t come home, Alex must rely on his friends, teachers and church to protect his sisters and help the family survive the apocalypse. As the weeks and months go on, Alex questions his faith and his love for his sisters as he has to resort to desperate measures to keep them healthy and safe. Help comes from unexpected places. Tragedy strikes when he least expects it. This is a gritty, frighteningly realistic portrait of a future out of our control. Who will like this book? : People who like reading intense books. Realistic horror fans who love stories that keep them up all night, thinking. If you like this, try this: This book has a companion novel, Life as We Knew It, by Susan Beth Pfeffer, about the same event, but told from the point of view of a girl living in the country. For mature readers, The Road by Cormac McCarthy.